Technically, there aren’t many things to do in Nusa Lembongan—Bali’s nearest island neighbor to the east. But that doesn’t stop lots of travelers from crossing the Badung Strait to check it out. 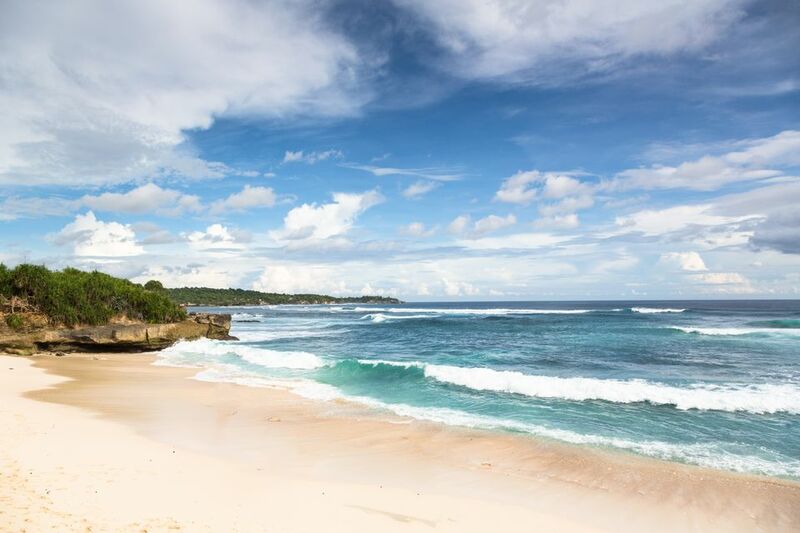 Perhaps the real draw for non-surfers is that Nusa Lembongan is an easy, convenient respite from Bali’s busy vibe. No major coffee shop chains have franchised there. Yet. Despite close proximity to one of the top island destinations in the world, Nusa Lembongan feels less mainstream, like an up-and-coming destination that should be enjoyed now before it becomes Baby Bali. The roads are rougher, the one ATM is often broken, and the Wi-Fi—if it works at all—is a lot slower. Those are good things when island escapes are involved. Most popular of the things to do in Nusa Lembongan is to go look for the manta rays. There’s a good reason they lure travelers from Bali: mantas regularly grow to over 20 feet in width! Snorkeling excursions offer a rare chance to see these majestic creatures sail through the water as they scoop up plankton. Their movements and behavior are mesmerizing. Although mantas do gather around Nusa Lembongan and nearby islands consistently, as usual, there are no guarantees when nature is involved. Booking a snorkeling trip doesn’t necessarily ensure you will see them. You’re definitely going to have to listen to other people on the island talk about them, so allow enough time for a follow-up snorkeling trip if the first one isn’t successful. Surfing is the original reason travelers first began coming to Nusa Lembongan. A number of breaks draw intermediate and professional surfers, although one known as “Playgrounds” is suitable for beginners. Most breaks crash precariously over reefs and are better reached by hiring a local boatman. If you’re still learning to surf, you’ll find better opportunities for newbies in Kuta, Bali, or on nearby Lombok. Nearly all the wave-catching action is centered around Jungut Batu on the northwestern side of the island. Jungut Batu is the most developed area on Nusa Lembongan. Although touring the mangrove forest isn’t “big” among the things to do in Nusa Lembongan, it’s a good option for bird lovers—especially ones in search of kingfishers. The mangroves can be explored independently with a kayak, or walk to Mangrove Point on the northeastern end of the island. Numerous guides in need of work will offer their boat services with tours as short as 20 minutes. The density of dive shops found on the island is a giveaway. Scuba diving around Nusa Lembongan and its neighbors, particularly Nusa Penida, is excellent. Visibility is often good in the summer months but currents can be challenging. Although whale sharks aren’t very common, giant mantas are! Along with mantas, there’s a chance to see the odd-shaped mola-mola (oceanic sunfish)—the heaviest bony fish discovered so far. The weight of a fully grown mola-mola can reach over 2,000 pounds! Even larger have been caught. The best time to see mola-mola is during the dry-season months, especially between July and October. Blue Corner Dive in Jungut Batu is a reliable dive operation that doubles as a popular nightlife spot for sunsets. Most popular of the attractions on dry land is the finger of lava jutting out from the island known as the Devil’s Tear. Waves crash along the sea cliffs sending spray high into the air. The green algae and blue water add colorful contrast to photos of the drama. You can get to the Devil’s Tear area by walking north from Dream Beach or south from Sunset Beach. Shared public transportation is also easy to find, or you can rent a scooter and add the viewpoints to a day of beach hopping. The lava rocks are sharp and brittle—not so easy to enjoy barefooted. Nusa Ceningan is attached to Nusa Lembongan via a yellow suspension bridge that collapsed in 2013 then again in 2016, killing nine people and injuring dozens. The new bridge was finished in February 2017. Walking across the narrow bridge is interesting, but driving across it on a scooter can be terrifying. Only attempt the squeeze if you’re confident you won’t cause an accident with oncoming riders as you brush legs in passing. The Secret Beach on the map that gets people excited isn’t as secret as it sounds. The beautiful scenery is worth seeing, but don’t be disappointed when you discover that a resort built above it. If you’re confident on a scooter, driving the backroads of the island is extremely enjoyable. Rent one from your guesthouse and go exploring! Use caution: The island is very hilly and has claimed its share of tourist skin due to scooter accidents. Some roads have been improved enough to encourage speed just before deteriorating back into gravely, potholed deathtraps. Some are barely wider than footpaths. Unlike Bali, most locals don’t use helmets on Nusa Lembongan—but you should! Rocky sea cliffs and lots of secluded bays yet to be developed invite stops. You’ll pass small Hindu temples, a couple of impressive viewpoints, and lots of mangrove forest along the way to the beaches. If you’ve ever wondered about commercial seaweed farming, you’re in luck! You’ll be able to spot a few operations along the coast. Dream Beach and Mushroom Beach are the two most attractive beaches on the island, however, the tranquility at Mushroom Beach suffers from boat traffic and arriving passengers. Stop off at the Devil’s Tear along the way to Dream Beach then enjoy lunch with a view at one of the restaurants on the cliff. On clear days, Paradise Beach offers great views of Mount Agung, Bali’s active volcano that erupted in November 2017. You can also enjoy volcanic views from Tamarind Beach—located near Mushroom Beach—while watching surfers make runs on Playgrounds. The dead-end road along the northern end of the island to Mangrove Point is often peaceful and inviting. Although you’ll have to park your scooter and decline some offers from the guides who set up on the path, you’ll find numerous chilled-out restaurants and bars for escaping the main road.